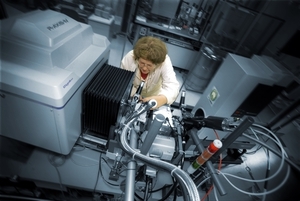 Dr Jenny Carmichael prepares a Protein Crystal sample for X-ray as part of the interlukin-6 Receptor Project, at Melbourne's CSIRO Molecular and Health Technologies facility. CSIRO and the Ludwig Institute of Cancer Research, partners in the Cooperative Research Centre for Cellular Growth Factors, have solved the structure of the interlukin-6 receptor protein. The interaction of this protein with the interlukin-6 molecule is implicated in the development of cancers and other diseases.